Pin Pad credit Card TerminalsIngenico Group’s PIN Pad terminals are engineered for all sales segments, especially high transaction volume retail. One of the central features is that they enable retailers to accept credit and debit card electronic payment transactions that require a Personal Identification Number (PIN). 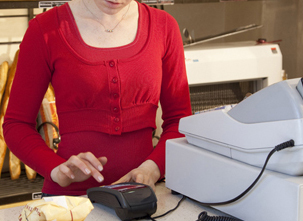 Our new iPP300 PIN Pad series is easily connected to cash registers and collection systems. These devices accept contactless payment and provide additional privacy and security at the PIN entry stage. They also manage a complete range of payments such as MSR, EMV chip smart cards and loyalty and pre-payment schemes, thus helping to generate more revenue for the merchants. S&S Bankcard Systems offers merchants Retail PIN Pads that are designed for high transaction volume in a retail environment.